Thanks to the National Archives for this information on the "Royal Patriotic Fund". The Fund was set up in 1854 during the Crimean War, Queen Victoria was concerned for the welfare of widows and orphans of deceased serviceman for which niether the Army or government made provision. The Fund was administered by commissioners and financed by public donations. 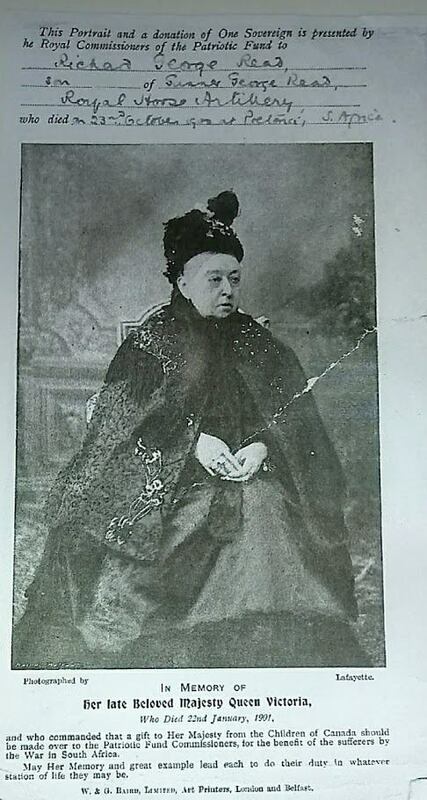 So successful was the Fund it was maintained throughout Queen Victoria's reign. The Commissioners made many grants and even had enough money to create a school for boys and one for girls. After nearly 50 years of work the Commissioners realised that it was not appropriate for the public to fully support widows and orphans. They petitioned parliament to grant pensions to widows, the first pensions to war widows were paid in 1901. Gunner 62478 George Read, O battery, Royal Horse Artillery died of dysentery on October 23rd, 1900 at Pretoria. Unusually his service papers survive on FindmyPast, most service papers for soldiers were destroyed. George, born in Lichfield, Staffordshire, first enlisted for the South Staffordshire Rgt in April 1887 but transferred to the Royal Artillery in September. In December1893 he married Mary Bayne in Aldershot, just after he had transferred to the Reserve. They had daughters, Hilda and Nellie and a son, Richard George, who was born in April 1899. Richard received a sovereign from the Patriotic Fund. It is not known if every child in the family received a sovereign. Re-called for war service in October 1899 George was not sent overseas until April 1900 when he was posted to O btty RHA. 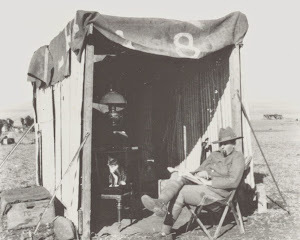 O btty had been involved in the 'Relief of Kimberley' campaign, then onto Johannesburg and Pretoria, and then following the Boer army eastward towards Portuguese East Africa. The sovereign the young Richard George would receive was worth £1, today (June 2018) that equals £117, although now Sovereigns are priced on their gold weight so they are worth about £221. George is commemorated on the Royal Artillery Memorial, London, and the memorial for the men of Birmingham in Canon Hill Park. George probably lived there while on the reserves as his wife's address is noted as 27 Flack Terrace, Park Rd, Soho, Birmingham. His widow, Mary, would remarry in 1905, to a Cpl Shipp, from U Btty RHA. Richard George followed his father's footsteps and joined the RHA age 14, he served in WW2 rising to the rank of Lt Quartermaster. He was captured by the Japanese in Singapore in 1942 and detained in Changi POW Camp. He died in Plumstead, south London in 1946 barely a year after his release from captivity. Richard's emotive Japanese POW Record card is reproduced on FindmyPast (you will need to pay to view it). Updated 10-06 with more family details.